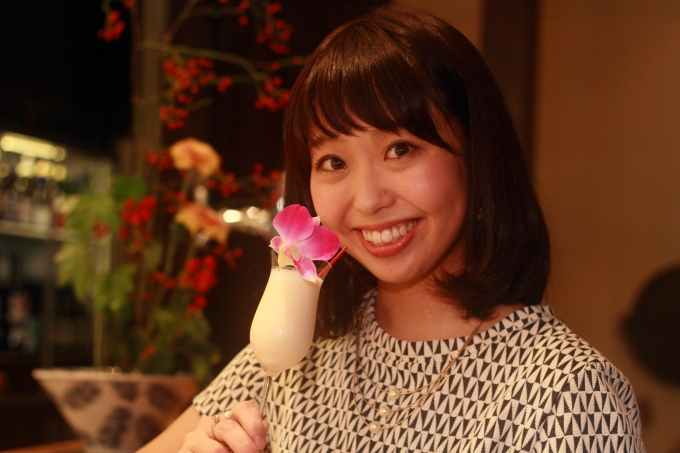 This time, Fukuoka, the head bartender of BAR enishi located in Saijo, Higashi-Hiroshima city, Hiroshima is going to make a cocktail. 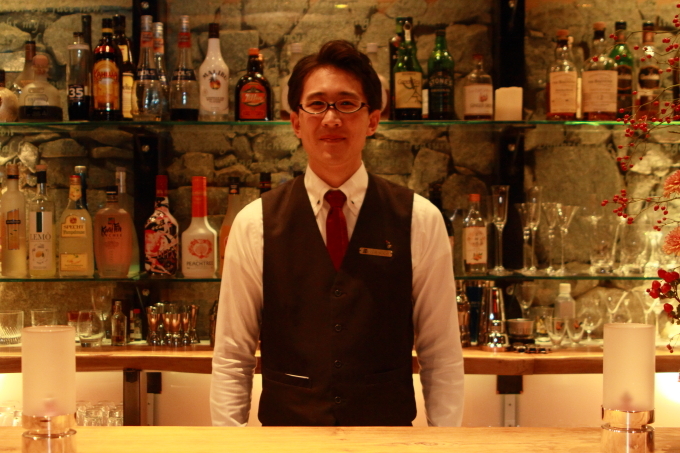 We asked him to make a cocktail for Yoshika, a regular customer of BAR enishi. 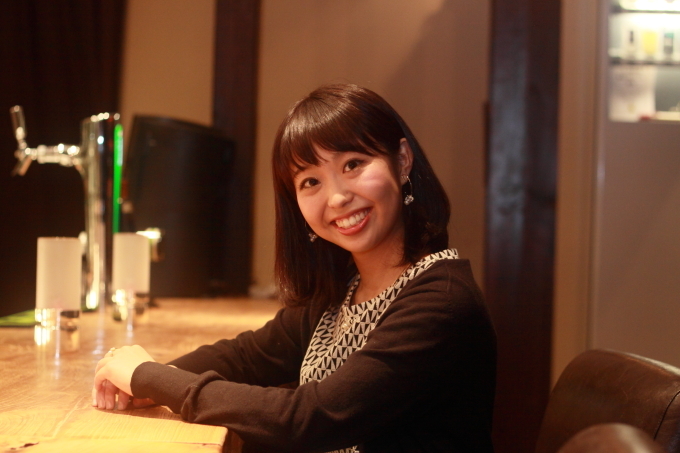 Yoshika is a 25 year old lady who lives in Saijo and works for a cafe. 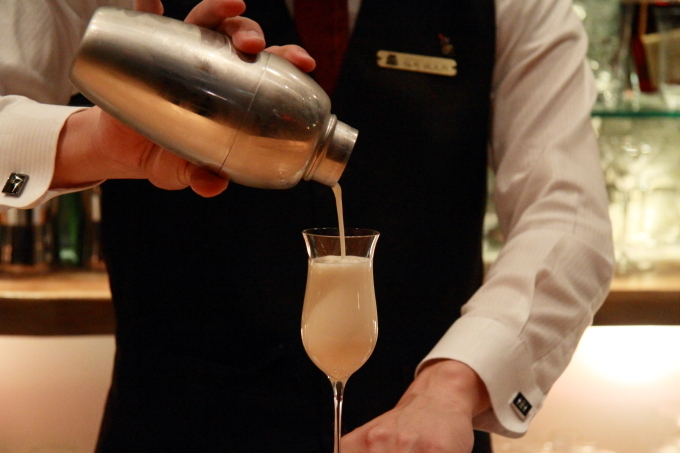 The base of the cocktail is the liqueur ‘La France’. Fukuoka is going to use these ingredients. Yoshika is a small pretty lady, so I thought of making a cute one rather than making a sharp looking one. Also, she likes pearl accessories as she has one on today as well, so I’ll make her a pearl coloured cocktail. 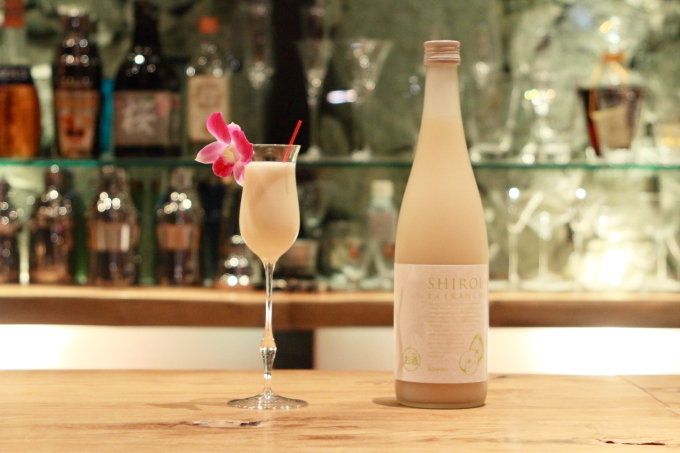 I’m going to make a dessert cocktail that can be enjoyed after a meal. Now he’s going to make it. 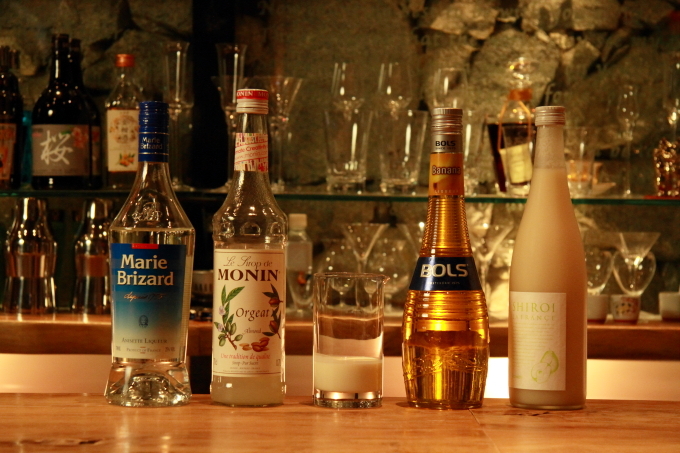 Put the La France (4/6) and banana liqueur (1/6) in a shaker. Add some cream (1/6) and almond syrup (1 tb). Pour the mix in a glass and it’s complete. 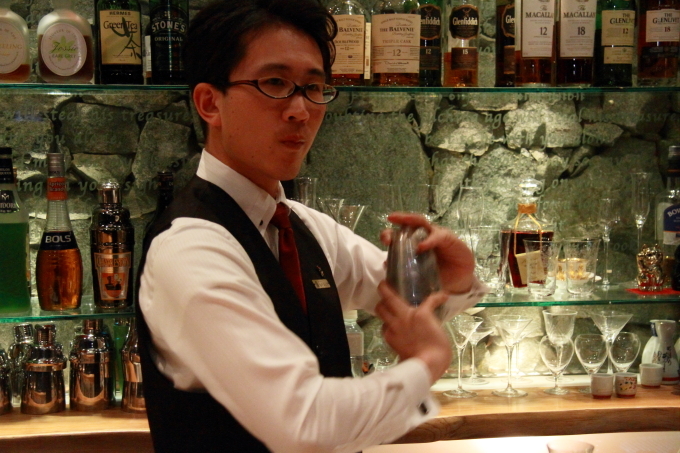 He served Yoshika the completed cocktail. It’s sweet but has a clear taste with banana and La France flavours coming through. 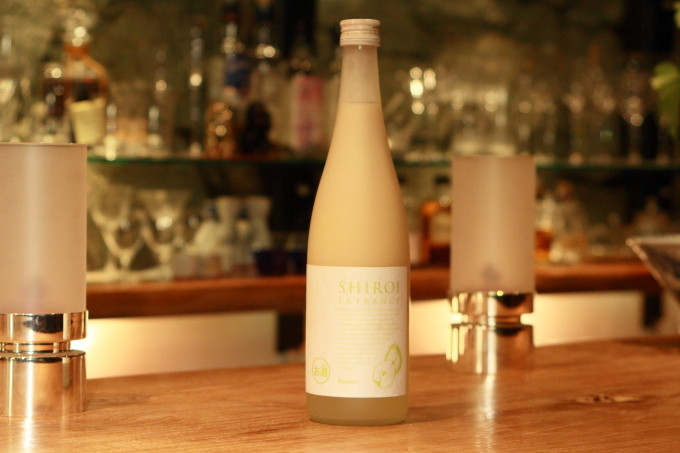 Drink it with a skinny straw so that the balance between the sweetness and acid will be perfect. How a cocktail is consumed is part of the recipe, isn’t it? This is definitely one for girls! Any lady would have to feel like she was pretty drinking this cocktail at a girls meet up or on a date. 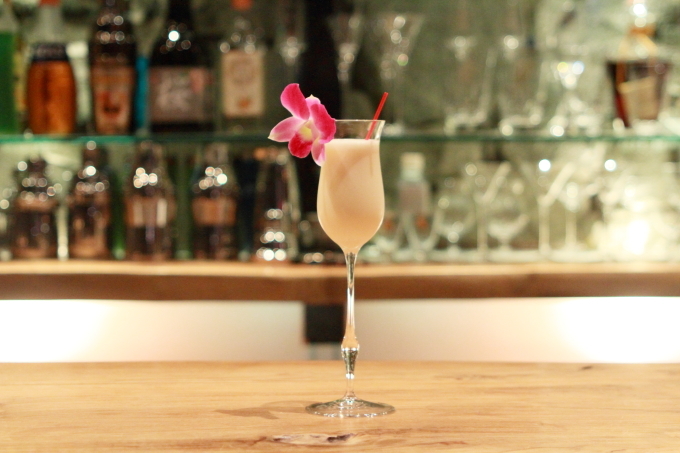 The cocktail ‘Pearl Maiden’ was born by Fukuoka imagining up something for Yoshika using the liqueur, La France. 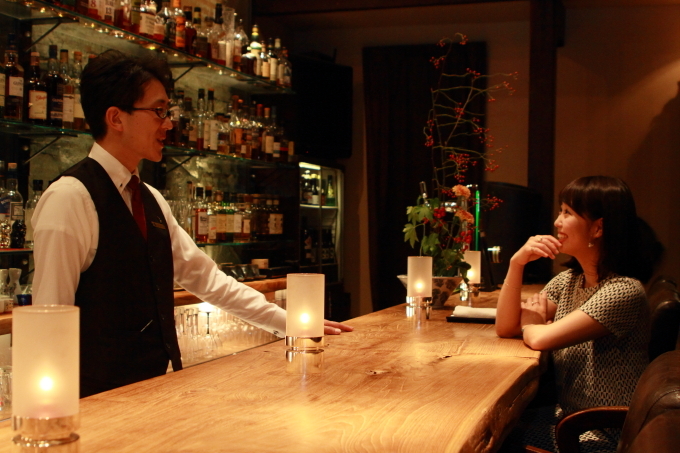 Thank you so much, Fukuoka and Yoshika.